Arriving in La Paz was literally a “breathtaking” event for us. Some other passengers of our flight, however, were obviously even more awestruck as they simply collapsed upon their first “impression” of the city. Or maybe also due to its most protruding characteristic: its height of about 3600 m above sea level. After an almost sleepless night of horrible headaches and nausea, we were eventually able to start discovering this stunning city which spreads out on a plateau surrounded by mountains with snowy peaks and of mighty heights of over 6000m. Our exploration tour, though, was a slow-mode-mission, as sightseeing in La Paz involves climbing hill after hill which was quite a challenge for us three breathless and still altitude-sickness fighting backpackers. This reminded us of San Francisco – simple relocated to South America and in dizzy heights. In the end, it took us a whole day simply to slender through the various market streets where everything is sold from fresh fruits and vegetables, to hopefully fresh enough fish and chicken, to pastries (generally containing lots of cheese and sugar – yes, usually combined in one pastry) and even witchcraft equipment. The next day, due to the help of lots of coca tea and time, we finally felt way better and were ready to take our exploration to the next (altitude) level. Thus, we boarded one of the local telefericos, (cable cars build by the Austrian company Doppelmayer!) 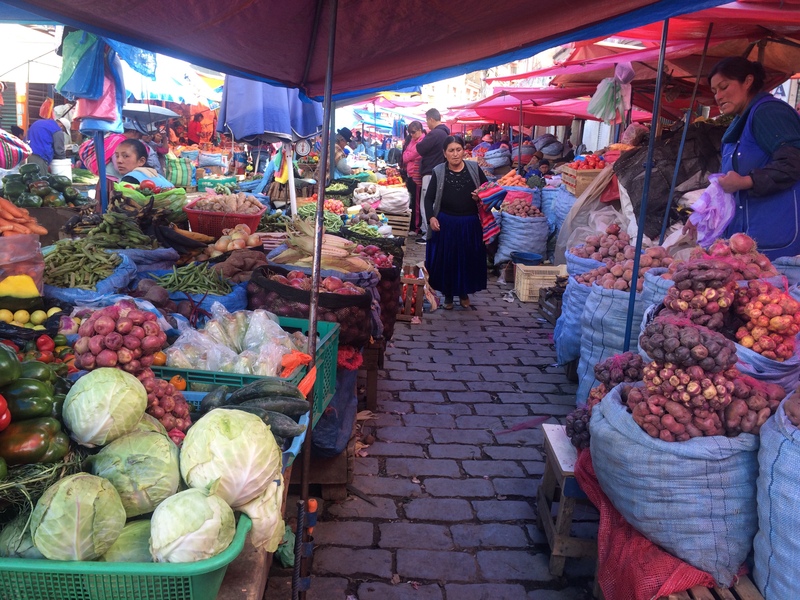 to El Alto, the city overlooking La Paz from an altitude of about 4200 m. There we enjoyed the great panorama, and a delicious lunch of chicken (the local top-top-top favorite food) and fried bananas at the local market. The next day it was already time to leave La Paz behind and bravely conquer the famous Yungas road to Rurrenabaque, the gate to the Bolivian part of the Amazon basin. Where to sleep: So far we are still looking for a nice place, let us know if you are more successful than us. Here are some potential places in La Paz. Where to eat & drink: The local markets – proper restaurants are not so easy to find – Burger King and some Chicken fast food places where the main recommendations for “good restaurants”. 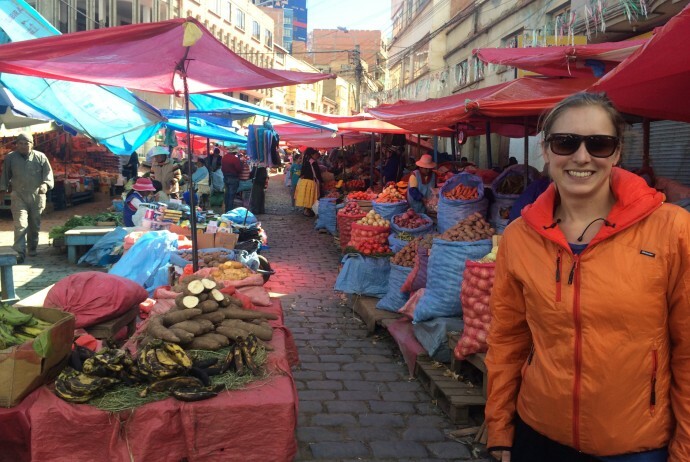 What to see & do: Chew coca leaves and take the teleferico up to El Alto for a great overview of the city.